ShowME Credit Solutions, LLC is a locally owned credit restoration firm specializing in defending consumers rights, successfully helping our clients remove negative/inaccurate/erroneous listings from their credit reports. Armed with over 10 years of experience in the field we have successfully helped countless amounts of clients repair their credit reports. From bankruptcies to late pays, from charge-offs to collections, we have challenged every kind of negative/inaccurate/erroneous listing and had excellent success in having them deleted from all of the major credit reporting bureaus. 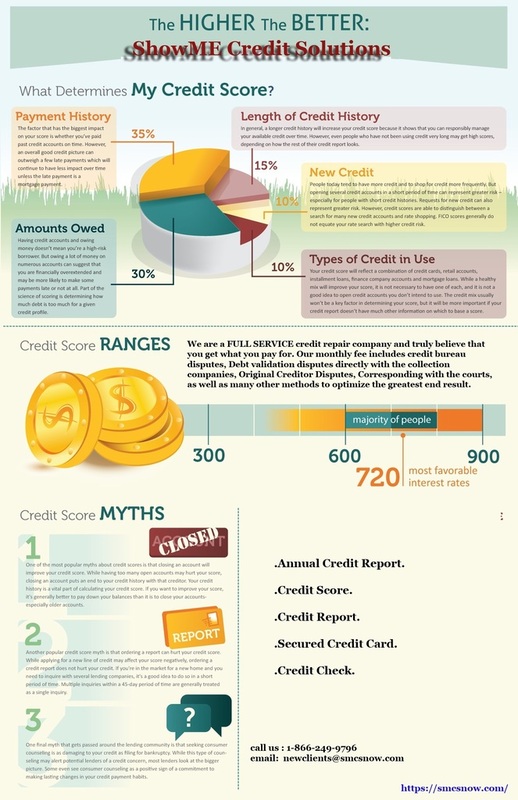 Your credit report does not own you! You own it! You have the right to legally challenge any and all items, good or bad, that you feel may be an unverifiable inaccurate/negative/erroneous listing and per the Fair Credit Reporting Act the credit bureaus must correct these items or remove them completely from you reports within 30 days of the dispute. ShowME Credit Solutions, LLC will utilize its aggressive strategies to help you remove these types of accounts from your credit reports. Your good credit can be restored by getting these inaccurate/negative/erroneous accounts removed from your credit reports. Another big part of repairing your credit score will consist of opening new lines of credit which we will assist with also.